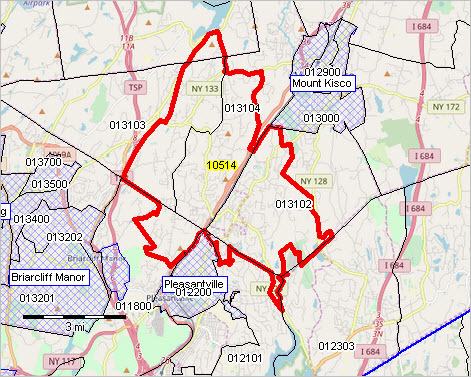 The following graphic shows ZIP code 10514 with a bold red boundary. Census tracts are shown with black boundaries with tract codes as white labels. See more about ZIP-Tract relationships. In some graphics, cities/places are shown with blue cross-hatch pattern. - view created with CV XE GIS software and related GIS project. - based on Census American Community Survey 5-year estimates; ACS 2015 and ACS 2016. - view/compare this area to other areas using demographic characteristics interactive table. - view/compare this area to other areas using social characteristics interactive table. - view/compare this area to other areas using economic characteristics interactive table. - view/compare this area to other areas using housing characteristics interactive table. - view/compare this area to other areas using business establishments interactive table. - this section expands to include 2016 data in May 2018. Source: ProximityOne and Census Bureau. negative values in 2015, 2016 data columns indicate data not available. This document is a proprietary resource developed by ProximityOne and is licensed to the subscriber/licensee for their own use. This document may be used in any manner except that it may not be distributed whole or in part. Any use of the document should reference the source as ProximityOne and the Census Bureau and include a link to the S&O Main Page. There is no warranty of any type associated with any aspect of this report. The user of this document is solely responsible to any use, direct or indirect, that might be made of this document. This document to provides data and informaiton to assess geographic, demographic, economic characteristics and trends for this area. There are several aspects important to effective use of this document. Accessing and Consuming the Data. The HTML document is designed for use with any browser using a tablet, laptop or desktop. The nature of the material is not intended for optimal use via cellphone. ACS Survey-based Estimates. All ACS estimates are subject to errors of estimation and other sources of error. The 2015 and 2016 data are based on 5-year estimates. The ACS 2015 data are centric to mid 2013. The ACS 2016 data are centric to mid 2014. Change columns, 2015-16 are not recommended for use to measure annual change. ACS Data Values & Top-coding. Negative values appearing in the data columns 2015 and 2016 indicate data not available. Note that a value of zero appearing in the data columns 2015 and 2016 may not in actuality be zero; as described above, these are estimates based on survey respondent data. Housing Price Index Notes. The Housing Price Index (HPI) is shown as an index with a base year of 2010. This HPI shows housing value appreciation since 2010. The HPI 2010 base year index is not available for all ZIP codes. Where tabulated, the HPI corresponds to a ZIP code area geography which may differ from the Census ZIP code area geography used elsewhere in this report. See the HPI by ZIP Code section for more information. ZIP Business Patterns Notes. The ZIP Business Patterns (ZBP) provide data on the number of establishments, employment and earnings. The ZBP data corresponds to a ZIP code area geography which may differ from the Census ZIP code area geography used elsewhere in this report. ZBP data reflect place of employment whereas ACS data reflect place of residence. See the ZBP section for more information. Detailed industry detail shown in section 3.1. use NAICS type of business codes. While the underlying database can be used to show all 6-digit detail, this profile is limited to 3-digit level, except for the Health Services sector (62) for which all types of business are shown.